The various culinary sages – Purple, Golden Variegated, Tricolor, s. officinalis, and Newe Yaar, have virtually identical flavors, but Newe Yaar has become a favorite with area herb gardeners and landscapers alike. Producing lovely pale blue flowers in early spring, this tall, beautiful sage will definitely make a statement in your garden. Madalene Hill brought Newe Yaar to the attention of American herb gardeners, and it is prominently featured in the McAshan Gardens at Round Top as well as in numerous Arbor Gate gardens. 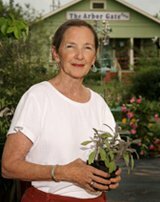 Like all sages, Newe Yaar is not at its best during hot, humid Texas summers, but it will survive, and a gentle pruning during the late winter will produce a flush of new growth and blooms come spring.